Welcome to Amsterdam, the 6th stop of our Start-up Hunt. Amsterdam is a city of 700,000 inhabitants, would you have guessed? Even though its population is nothing compared to the likes of European hubs London (8.7 Million), Paris (2.7 Million) or Berlin (3.4 Million), the city truly rivals the leaders of the pack and positions itself as a key player in the startup world. 2006 was one of the defining moments in Amsterdam’s evolution as a start-up hub. Indeed, that year, the Next Web decided to host its first conference in Amsterdam, opening the city to the global startup world. In the following years, incubators such as Rockstart and Startup Bootcamp flourished, accepting their first classes in 2011. Today, TQ, WeWork, B Amsterdam, Rockstart and Startup Bootcamp are the main hubs, each combining start-ups and big corporates to foster a nurturing environment for founders keen to learn from the big guys such as Catawiki or Booking. Some big international tech players like Uber and Netflix have even decided to set up their European headquarters in Amsterdam. The Dutch speak English fluently and are among the highest achievers in maths and science around the world. Amsterdam’s largest university, the University of Amsterdam, boasts 30,000 students and is one the leading general research universities in Europe. Solid foundations in the education system indeed offer a reliable framework for growth. 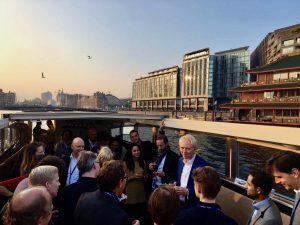 The Netherlands’s startup scene found its roots in fintech, health tech, software and smart energy among others, proof of the country’s aspiration to become a tech hub. Singularity University is another key player who’s aim is to find solutions to global challenges through people and technology, including artificial intelligence, robotics, nanotechnology and digital biology. Funding is widely accessible in the Netherlands, some say there might even be too much of it. Startup Delta, for example, facilitate funding in the startup ecosystem. A paradise for startups? Not in every aspect. Dutch Venture Capital funds have the reputation to be quite risk-averse, traditional, and usually focused on the Netherlands only. This leaves a gap for us to fill, you know how much we looove disruption and risk. A few exceptions remain of course. Karmijn is the type of company we love, forward-looking and breaking the rules. This venture capital fund was founded by 3 women, an extremely rare occurence in the VC world – let’s see more of this! Transport is also a major aspect of Amsterdam’s development as a hub. Indeed, the Netherlands has an extremely efficient transportation network linking the five biggest cities of the country – Ultrecht, Delft, Rotterdam, Hague and Amsterdam – which represent half the country’s population: 9 million people. The government is deeply involved in the start-up ecosystem and is a key pillar in its development. IAmsterdam offers many support programs for entrepreneurs and Startup Amsterdam, a government-backed initiative launched in 2014 by Nellie Kroes, has taken on a major role in the development and promotion of the Dutch start-up ecosystem. Banks have also started to get involved in the start-up scene by investing in start-ups and offering support programs to entrepreneurs; Rabobank being a great example of that. However, cynics say the banks use this support more as a marketing tool, rather than actually believing in their projects… we’re not getting involved! What truly differentiates Amsterdam from any other start-up scene though is the involvement of the Royal Family in the economy in general. Indeed, Queen Maxima represents microcredit and women entrepreneurs, while Constantin Van Oranje, the King’s brother, is the patron of start-ups and tech. He coordinated the whole of Amsterdam Capital Week and might even become a OneRagtime investor soon… a very modern monarchy! When asking around what people think is missing in the Amsterdam ecosystem to make it surpass London or Berlin, the response is almost always “the number of people”. It’s true, with 700,000 people Amsterdam has already become a fundamental player of the European start-up ecosystem, what could it achieve with a few million…? !